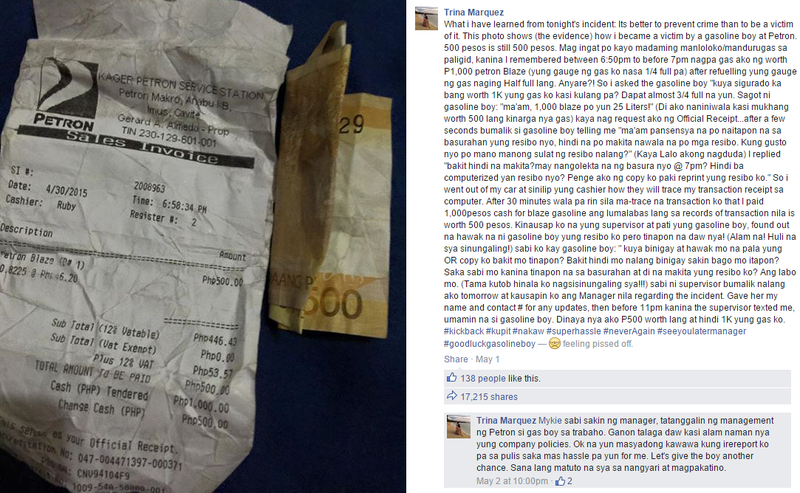 A gasoline boy from Kager Petron Service Station - Makro Petron in Imus, Cavite got fired from his job for allegedly swindling a customer. The business establishment's manager told the victim, Trina Marquez, that they have considered terminating the gas boy for violating company policies. In a lengthy Facebook post, Marquez narrated that on the evening of April 30, she drove to the gas station to refuel. She paid P1,000 worth of Petron Blaze, but noticed that the gauge indicated the tank to be only half-filled when in fact it was already "1/4 full" prior to refueling. With an expectation that her car's tank should be "3/4 full," Marquez asked the attendant if what she paid for was completely loaded. The latter answered in the affirmative and even pointed out that P1,000 is equivalent to 25 liters of Petron Blaze. Doubtful, the customer requested for an Official Receipt. When the gasoline boy returned, she was told that her receipt was nowhere to be found after it was thrown in the trash can. Thinking that something was wrong, Marquez asked that her receipt be reprinted. She got out of the car and watched the cashier as the latter tried to trace her transaction. 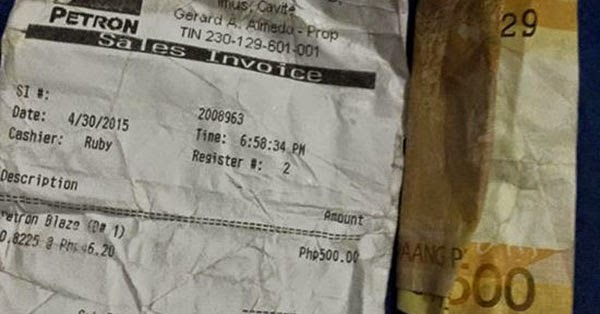 Thirty minutes passed yet there was no indication that the cashier could trace the P1,000 transaction so she decided to talk to the supervisor. Before leaving the establishment, Marquez gave the supervisor her contact number. She later received information that the gasoline boy made a confession. The customer said she learned a lesson from the incident. "It's better to prevent crime than to be a victim of it," she posted.